Excellent styling tool to scrunch, mould and style hair. Zirh Body Bar provides a rich antioxidant skin cleansing sensation. A lightweight lotion that hydrates, smoothes and reconditions. Replenishes your skin with vital nutrients so that it looks its best. The fresh and refined fragrance in a richly lathering bathing soap. A distinctive, masculine, and powerful fragrance for men. An easy to use styling gel that provides a very strong hold all day. A powerful, sensual and extravagant fragrance. Spots and pimples are a blight that effects everyone from time to time. Oily skin is a common problem, caused by over activity of the sebaceous glands. Signs of anti-ageing, what causes it and how to combat it. Some tips and recomended products to help reduce dark circles and give your eye area a lift. A condition where the hair curls back or grows sideways into the skin to causes irritation, inflammation and sore bumps. 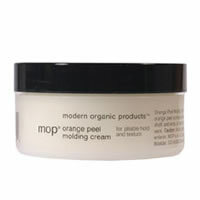 MOP Orange Peel Molding Cream lets you mold and shape hair leaving little shine but lots of texture. MOP Orange peel molding cream is used for separation that holds and wont break down throughout the day. Certified organic liquorice and marshmallow produce a textured to add depth with a matte finish to modern hair. Baldessarini Strictly Private is a rich ambery fragrance with a oriental and woody texture. Baldessarini Strictly Private is an opulent ambery woody vanillic scent enriched with warm spices and rich green notes, as it begins with Basil, Bergamot, Juniper, Pepper over Vetiver, Pine, Patchouli, Rose and a base of Cedar and Vanilla. Payot Laboratories have created a beautiful and lightly textured tange of skincare that combines gentle, natural methods, medicinial herbs and facial movements for complete well being for body and face. Fudge Lite Hair Shaper is a medium hold texturising cream for fine or longer hair. Fudge Lite Hair Shaper texturises, pieces and moulds fine hair, whilst also thickening, controling and texturising the hair. Yves Saint Laurent L'Homme Nuit is a fresh oriental fragrance that is the darker side of the YSL L'Homme Man. A story of seduction, intensity and bold sensuality. Keep up to date with all thelatest news from Menstyle. Sign up for new products, special offers and beauty features.